Tired of wearing socks with those low profile skimmers, flats, and sneakers and having them obnoxiously stick out in an annoying fashion? 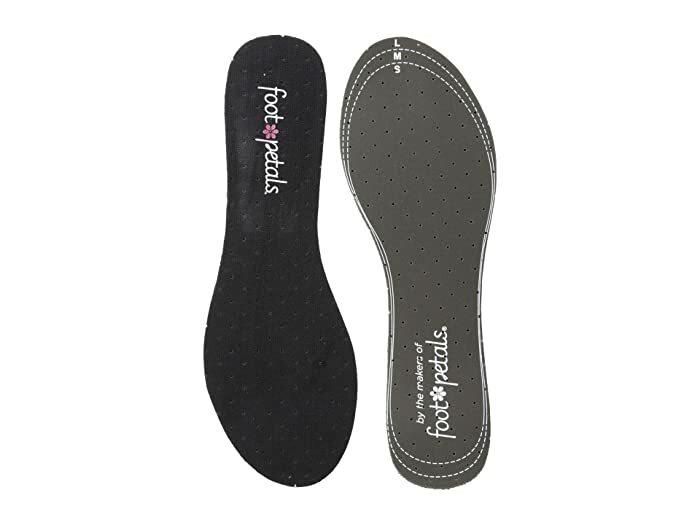 Ditch the socks and slip these Foot Petals® sock-free saviors into your favorite shoes for instant foot protection! You'll be able to wear your favorite shoes and feel great at the same time! And honestly, isn't that every gal's dream come true? Includes one pair of Sock-Free Saviors. DRI comfort moisture management system built into terry cloth padding to keep feet cool and dry. PORON® cushioning absorbs shock for all-day comfort. Microban antimicrobial protection won't rub, wear, or wash away. Ventilated to keep feet dry. Customizable to fit shoe sizes 6-10. Trim to fit. Fits all types of closed-toes shoes including sneakers, flats, boots, etc. Gentle machine wash cold, no bleach, dry flat.